Every year, the reality of getting a flying car is getting closer and closer. In the past few years, we had the EHang taxi drone concept, and the Airbus flying car concept to whet our appetites but it seems like the next best thing is here. This year, Bell, which you may recognize as the name in helicopter manufacturing, from the original military models in the 1940s to the V-22 Osprey tiltrotor (produced in cooperation with Boeing), has come up with a concept design for a hybrid electric flying taxi. Codenamed The Nexus, this air taxi is probably going to be within Uber’s planned flying fleet, because Bell is one of the companies on Uber's short list of aircraft manufacturing partners. Bell was one of the first aircraft manufacturers to team up with Uber in 2017, when the ride-hailing company first released its ambitious plan to create a network of flying taxis as a way to solve city-wide traffic problems. The Nexus comes equipped with a 150-mile range, a top speed of 150 mph, expansive windows for great views, an augmented-reality-enhanced flight experience. The Nexus will use six tilting ducted fans powered by a hybrid-electric propulsion system, with wings helping supplement lift in forward flight, and rely on the six 8-foot-diameter fans for forward thrust and, while pivoted to the horizontal, takeoffs and landings. Bell’s best advantage over its competitors is the experience. As the company behind the V-22 Osprey and V-280 Valor tiltrotors, as well as decades of military and civilian helicopters, it knows its way around the design and manufacturing of vertical-lift aircraft. The Nexus concept shows what the company hopes to build with that experience, a small, consumer friendly aircraft that comfortably seats four passengers and a pilot. “This is an aircraft you would feel safe and comfortable bringing your family into.” said Scott Drennan, director of innovation at Bell. 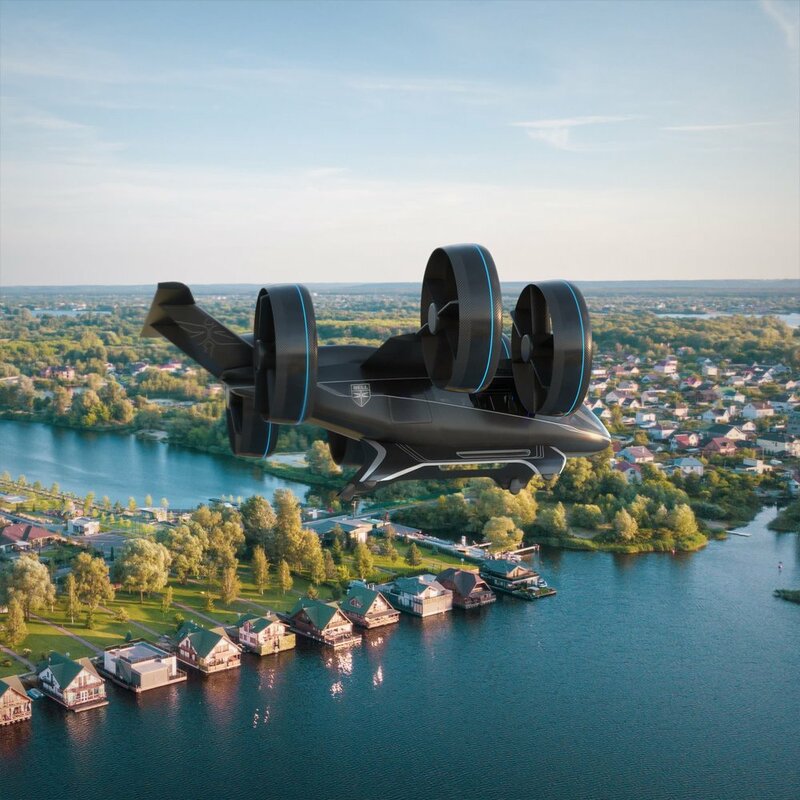 He argued that the key element about the aircraft was its “approachability,” which makes it the ideal vehicle for this proposed flying taxi service. Bell hopes to be able to have its first test flights in early 2020, with consumer deployment following not long after that. Bell’s superior groundwork in flight engineering based in reality is something that most flying car startups can only dream of having. However, getting to that point will take a little bit more than experience. For one, Uber’s planned flying service consists of sending passengers via electric and autonomous means, with the ability to take off and land vertically don’t exist yet, and neither does the infrastructure to support it. There is also the issue of navigating through tons of legal barriers before flying taxis can get off the ground. Experts suggest that engineering and regulatory hindrances may prevent flying cars from ever taking off in a meaningful way. However, as there are more and more startups which are envisioning a future where mankind will take to the skies in their daily commutes, this may soon be an issue of the past. Bell’s experience in mass aircraft production, which few of its competitors can match, will be vital in its future growth. Mark Moore, engineering director of aviation at Uber, said the concept was an important “first step” toward an all-electric, fully commercial flying taxi service. What do you think about the upcoming Uber flying taxi concept? Would it be a feasible one? Leave a comment below!